We live in a world full of ever-changing noise with both natural and industrial origins. Despite this constant interference, we’ve developed several strategies for communicating with each other. If you’ve ever attended a busy party, you’ve probably found yourself shouting to be overheard by a nearby companion, and maybe even had to repeat yourself a few times to be understood. Whales are even more dependent on sound for communicating with each other. For example, each autumn bowhead whales, a species of baleen whale, migrate along the Alaskan North Slope from their Canadian summer feeding grounds towards the Bering Sea. During this voyage, they make numerous low-frequency sounds (50-200 Hz) that are detectable on underwater microphones, or “hydrophones,” up to tens of kilometers away. There are many mysteries about these calls, such as what type of information they convey, and why their frequency content seems to be shifting downward with time (Thode et al., 2017) for unknown reasons. Nevertheless, scientists generally agree that bowheads use these sounds for communication. Changing conditions in the Arctic have encouraged more human industrial activity in this formerly remote region. For example, over the past decade multiple organizations have conducted seismic surveys throughout the Arctic Ocean to pinpoint oil-drilling locations or establish territorial claims. The impulsive “airgun” sounds generated by these activities could be detected over distances of more than 1000 km (Thode et al., 2010). 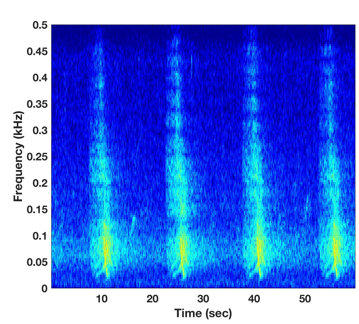 (Figure 2: Spectrogram of seismic airgun signals along with bowhead whale calls; sound file attached 4x normal speed). Previous work by our team has found that bowhead whales double their calling rate whenever distant seismic signals are present (Blackwell et al., 2015). But what consequences, if any, could this behavioral change have on the long-term health of the bowhead population? To answer this question my colleagues at Greeneridge Sciences Inc. and I have studied how bowhead whales respond to natural changes in noise levels, which during the summer and fall are caused primarily by wind in the relatively ship-free waters of the North. 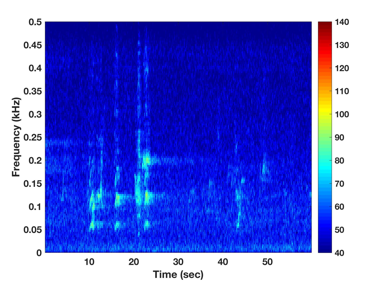 We found that, like humans at a party, whales can respond in two ways to rising noise levels. They can increase their loudness, or “source level,” and/or they can increase the rate at which they produce calls. Measuring this effect is challenging, because whenever background noise levels increase it becomes difficult to detect weaker calls, an effect called “masking”. Because of masking, as noise levels rise one might measure a decrease in calling rate as well as an apparent increase in call source levels, even if a whale population didn’t actually change their calling behavior. To solve this problem our team deployed multiple groups of hydrophones that allowed machine learning algorithms to localize the positions of over a million whale calls over the eight years of our study. We then threw away over 90% of these positions, keeping only calls that were produced at close range to our sensors, and thus wouldn’t become masked by changes in noise levels. Continuing the party analogy, we effectively only listened to people close to us, so we could still detect whispers along with shouts. We found that whales tried to increase their source levels as noise levels increased, but when noise levels became high enough (75% of maximum noise levels encountered naturally) the whales didn’t call any louder, even as noise levels continued to rise (Figure 3). Figure 3: Relationship between background noise level and whale calling level, for calls made within 3.5 km of a sensor. Whales do, however, keep increasing their call rates with rising noise levels. 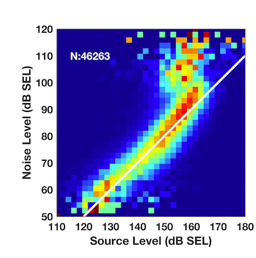 We found that a 26-dB (400-times) increase in noise levels caused calling rates to double, the same rate increase caused by seismic airguns (Figure 4). 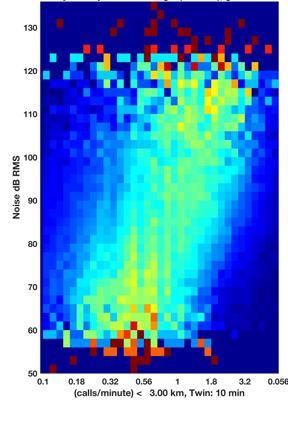 Figure 4: Image of relationship between whale calling rate (over ten minutes) and background noise level. This work has thus allowed us to place bowhead whale responses to human disturbance in a natural noise context, which eventually may assist us in evaluating the long-term impact of such activities on population growth. Blackwell, S. B., Nations, C. S., McDonald, T. L., Thode, A. M., Mathias, D., Kim, K. H., C.R. Greene, J., and Macrander, A. M. (2015). “The effects of airgun sounds on bowhead whale calling rates: evidence for two behavioral thresholds. ,” PLoS One 10, e0125720. Thode, A. M., Blackwell, S. B., Conrad, A. S., Kim, K. H., and Michael Macrander, A. (2017). “Decadal-scale frequency shift of migrating bowhead whale calls in the shallow Beaufort Sea,” The Journal of the Acoustical Society of America 142, 1482-1502. Thode, A. M., Kim, K., Greene, C. R., and Roth, E. H. (2010). “Long range transmission loss of broadband seismic pulses in the Arctic under ice-free conditions,” J. Acoust. Soc. Am. 128, EL181-EL187.